THE Waterway Recovery Group’s Canal Camp programme will feature 28 Canal Camps across 13 different waterways in 2018. More than 400 volunteers are expected to sign up to the week-long residential camps, which in 2018 will include four sites where the project is close to completion or return to water, as well as three family camps. The aim of the programme is to support the work being carried out by local canal restoration groups to help return even more canals back to navigation. ♦ Lancaster Canal where volunteers will be re-lining a section of ‘the first furlong’. Once these four projects are finished over 1,000 yards of canal will have been returned to water. The photograph shows work on the Montgomery Canal. Following the success of the Group's first Family Volunteering Weekend in 2017, three further weekends are planned in 2018—on the Grantham Canal, Chelmer & Blackwater Navigation and Uttoxeter Canal. Families with children aged between 8 and 14 will have the opportunity to experience canal restoration first hand. 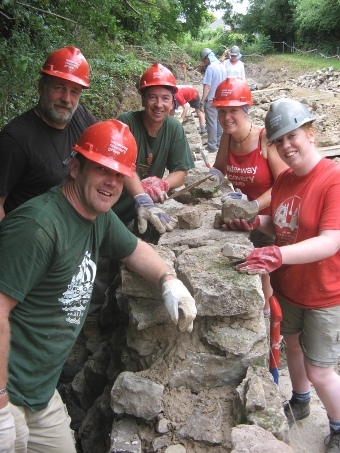 “Canal Camp volunteers have the chance to learn new skills, meet new people and enjoy new experiences. Waterway Recovery Group Camps aim to give a significant boost to local restoration societies through an influx of volunteers over a single week or series of weeks and allow substantial progress to be made over a short space of time.